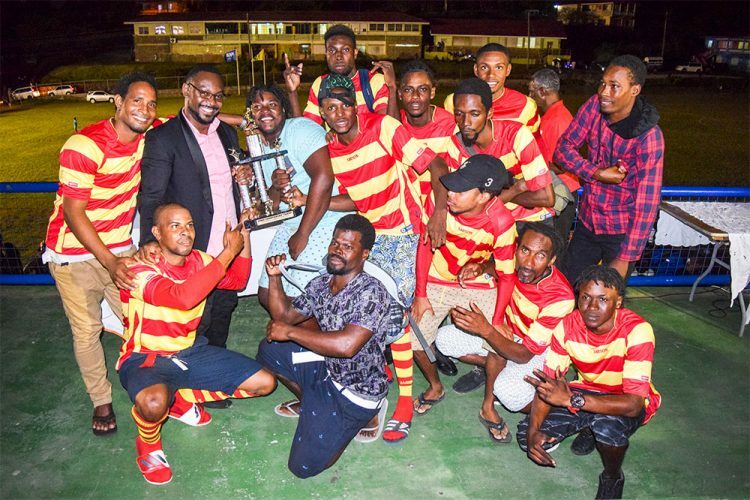 South marked a piece of football history on the Grenadine Island of Bequia last Friday night, when that outfit won the first ever Bequia Football Association zonal football title. Playing under improvised lighting at the Clive Tannis Playing Field, South beat East 3-1, to finish on 19 points, thus pipping West and East, who both ended on 19 points each. In Friday’s final match, East got on the score sheet in the 26th minute through Damion Bynoe. A three-goal blitz in the second half, started by an own goal conceded by East in the 50th minute, sparked a resurgence from South. Dumeroo Hanhim added the go-ahead goal in the 67th minute and Jamal Ollivierre iced the proceedings in the 82nd minute, to please the vocal following which the South team had at the venue. The win gave South the hold on the first place trophy and a $3,000 cash prize. West finished second and received $2,000 and third place- East gained $1,000. Central, North East and South East were the other zones which participated. They all received small cash awards for their efforts. Apart from the MVP awards for players from each of the six zones, two other individual awards were presented. Derek Penniston was awarded the top goal-scorer award and Jomara Adams was adjudged the best goalkeeper. Playing alongside the zonal competition was a four-team Under-17 competition. Finishing on top in the Under-17 division was Rising Stars. Docking second was Future Stars, with Combine Stars, third, while Young Stars ended fourth. Like the zonal competition, there were awards for the teams’ MVPs. 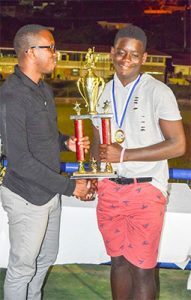 The Rising Stars’ duo of Josh Stowe and Marlon Simmons, copped the best goalkeeper and top goal-scorer awards, respectively.